The PCs will spend $90 million, compared to the Liberals' $100 million spent on flu season last year. Minister of Health Christine Elliott looks on as Premier Doug Ford speaks at Queen's Park in Toronto on Sept. 17, 2018. TORONTO — Ontario will spend $90 million this year to fund hundreds of hospital beds ahead of flu season, a measure the province's health minister said will help address the issue of so-called hallway medicine. Christine Elliott said the funding will help Ontario's hospital system deal with overcrowding that has resulted in patients being treated in unsuitable spaces. "It's unacceptable to see our loved ones treated in hallways and in storage rooms in our hospitals," Elliott said Wednesday. "It's no way to treat our loved ones." The government will fund 1,100 hospital beds in total, including more than 400 opened under the previous Liberal government that will have their funding renewed. In October last year, the Liberals gave hospitals an additional $100 million before flu season to create roughly 1,200 more hospital beds. The Progressive Conservative government could not immediately say Wednesday how many of those beds — which are meant to bring temporary relief to hospitals at a busy time of year — are still operating. Nor could it say whether the $90 million came from previously announced health-care spending. The government also said it will continue an expansion of the province's long-term care beds planned by the previous Liberal regime, adding 6,000 new beds as part of a five-year plan to build capacity. "These are meaningful early actions we are taking to end hallway health care," Elliott said. Premier Doug Ford said the additional beds mark just the first step in addressing the long-term needs of the health care system. "With an aging population, time is of the essence," he said. "That's why I've asked Minister Elliott to focus on building a strong, vibrant and sustainable health care sector that puts the needs of Ontario's patients first." The premier said it's time for politicians to listen to experts, not the other way around. Interim Leader of the Ontario Liberal party John Fraser speaks to media at Queen's Park in Toronto on July 11, 2018. Interim Liberal leader John Fraser said the Tory government is simply maintaining the flu season support his party brought in. "I don't see where there is new capacity being built in there," he said, noting the Tories have announced roughly the same number of beds his party did last year. "There's nothing new here." 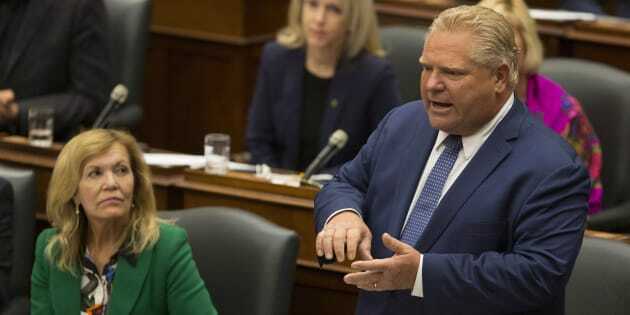 NDP Leader Andrea Horwath said last year's Liberal commitment, and the latest spending by Ford's Progressive Conservatives, falls far short of the $300 million she said is needed to help address hospital overcrowding. "This is not going to affect in any way the hallway medicine that is being experienced by people in our province," she said. Wednesday also marked the inaugural meeting of the premier's council on improving health care, a group meant to recommend possible strategies to improve the health care system and make it more efficient. The council is chaired by Dr. Rueben Devlin, a former Progressive Conservative party president and former CEO of Humber River hospital. The job, to which he was appointed this summer, comes with a $348,000 salary plus paid expenses.